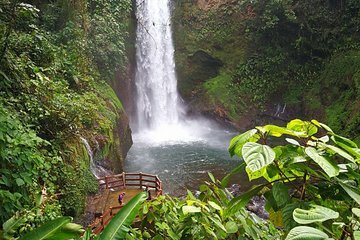 Safely immerse yourself in Costa Rican nature and wildlife on a 7-hour tour to La Paz Waterfall Gardens. Leave the busy streets of San Jose behind in comfortable air-conditioned transportation from your hotel. Discover more than 100 species at the sanctuary, including titi monkeys, 2-toed sloths, pumas, and margays. You can even feed hummingbirds by hand. Have your camera ready for the cloud forest, waterfalls, and aviary.